Aaron Angell, Platter, 2017. Reduced stoneware with ash glaze and dead frog residue. Courtesy of Rob Tufnell. Blown along by the remnants of Ophelia, or maybe it was the overtures of the (frankly Pythonesque) Storm Brian, I went south of the river this week. Two shows have cropped up in conversation repeatedly in the last few days and I highly recommend them both to you as a reason for a weekend jaunt. First up was Juha Pekka Matias Laakkonen in the large ground floor space at Corvi-Mora gallery. 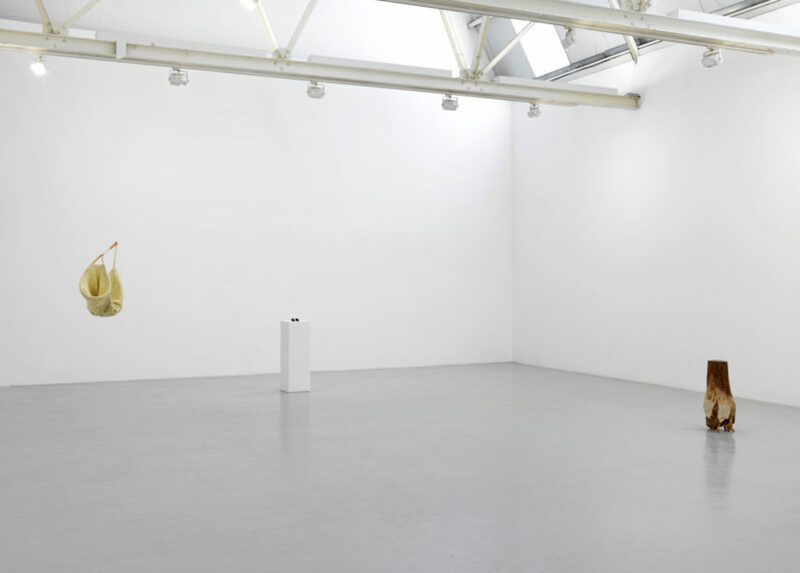 This is the second time the Finnish artist has shown in London. Just five works comprise his new exhibition – sparely disposed around the room, so that one travels self-consciously from one to the next. As you enter the space, on the right is a pair of footprints, apparently cut from a mossy forest floor. 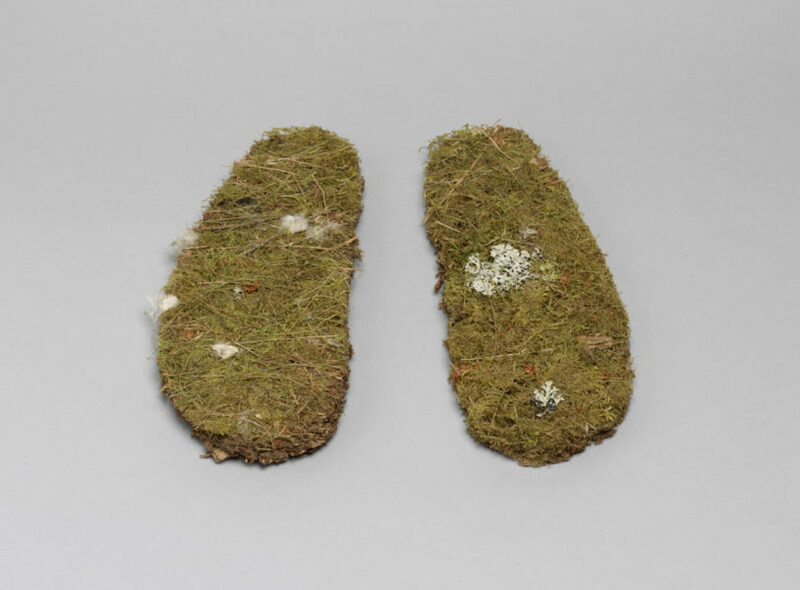 “The growth beneath one’s feet” is a wonderfully concise, poetic gesture. It conjures an image of the absent artist who stood on this spot, then transported it, and his interaction with it, to London. 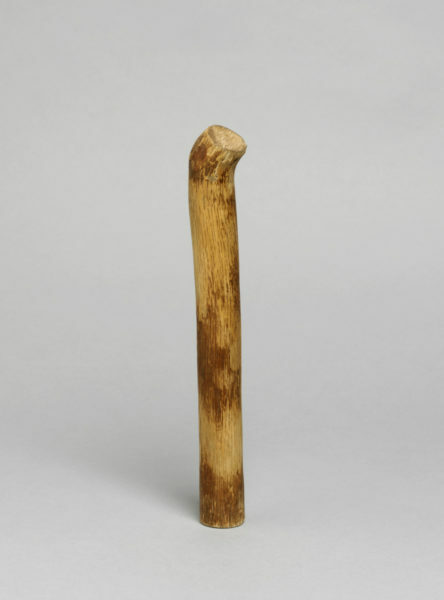 Behind and to the right of it, is a short, pale stubby branch poking up from the floor. Captioned “Two parts separated from a whole, knocked against each other until all bark was removed. 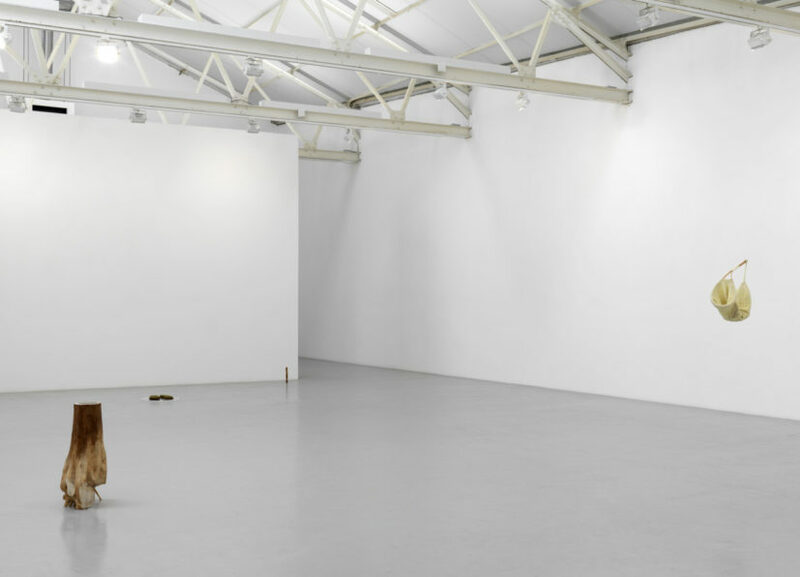 One brought back to the whole”, the ritual nature of Laakkonen’s work is immediately apparent, and all the other works have similarly descriptive titles. 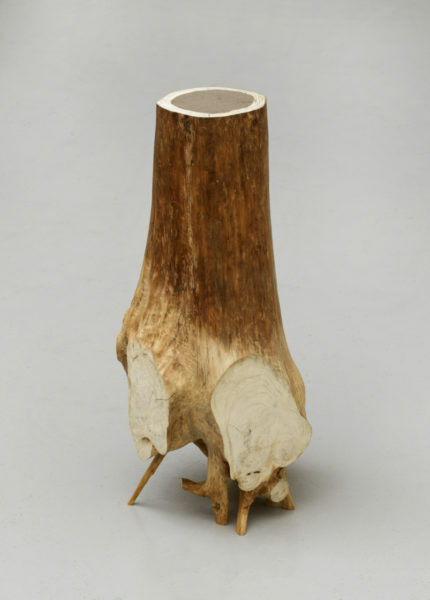 There is a relationship to Land Art here, in the way the artist uses only natural materials and engages with the environment through performative, almost shamanic gestures. But there is also the occasional flash of humour with a darkly fairy-tale twist. 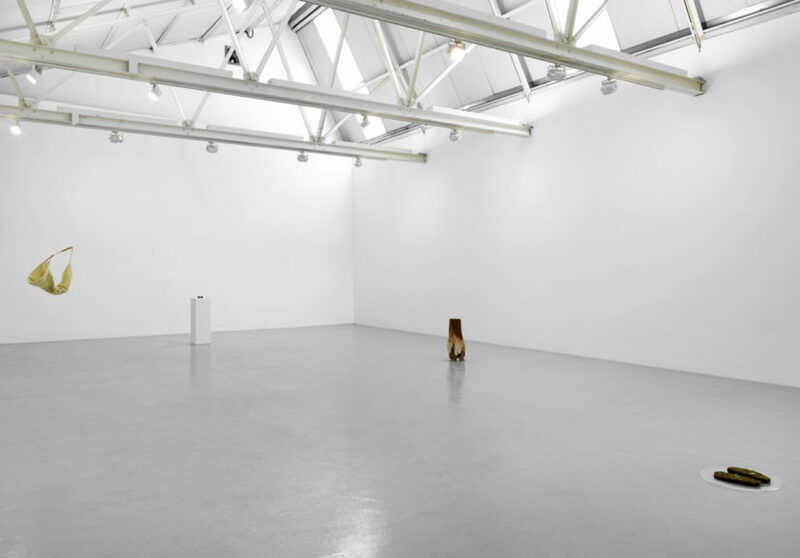 On the opposite side of the gallery, presented very formally on a slim white plinth, sit two tiny boots. They are slightly hairy and have claws. 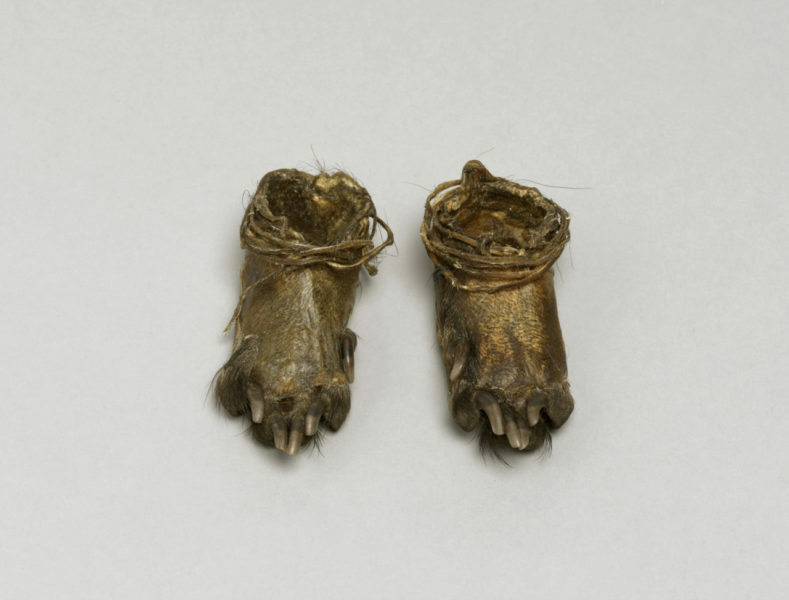 The caption, “From the feet of an animal killed in traffic”, gives them an almost bathetic quality – which cruel sprite would wear these? 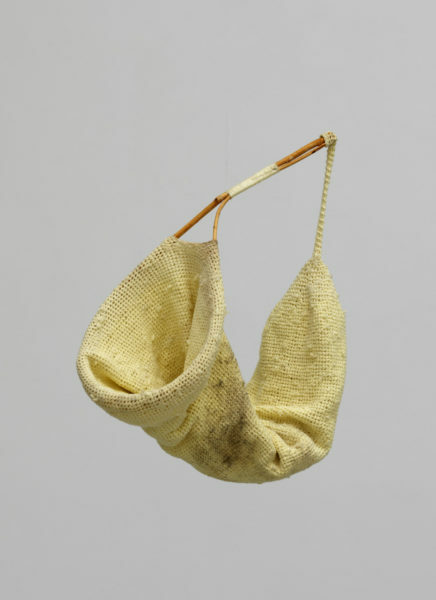 Laakkonen also has a fondness for knitted things, and for the durational act of knitting itself. 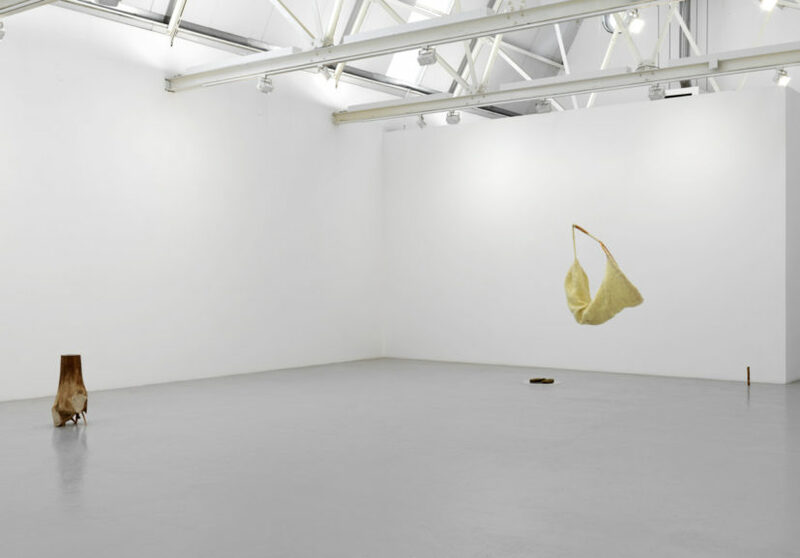 Hanging to the left of the gallery is a strange, pale yellow contraption that has the unmistakable aura of the bricoleur’s pragmatic solution to a very specific problem. It is a little bit grimy, as if it had actually seen use: “A tool to reach and catch a piece of a rock face about to detach and fall. Made over the course of a month from the jumper worn at the time of committing to pre-empt the imminent disaster”. The “title” is not just a description, but a whole story with a rich set of images: the rock face, the original jumper and an atmosphere – the anxiety that was the impetus for this improvised solution. There is a compelling tension between the economy of Laakkonen’s formal vocabulary and the richness of his conceptual constructs. Just the other side of the Kennington Road, on Lambeth Walk, Rob Tufnell has set up a space in a down-at-heel parade of shops, the like of which one rarely sees these days in London. It has an old-fashioned chippy, a launderette and a fruiterer. Inside number 139 is a group of new ceramic works by Aaron Angell. Angell has recently shown at Tate St Ives, as well as being part of Glasgow International and the last British Art Show. 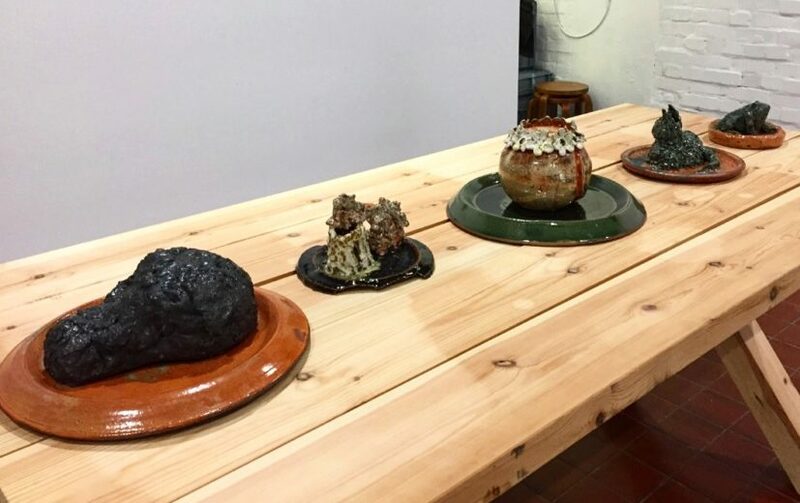 He has solo shows opening at GoMA in Glasgow in December and at the Freiburg Kunstverein next year, and is known for work which heretofore has made much of his lack of formal training in ceramics. This new body of work includes a menagerie of wonkily formed animals (cats, frogs), as well as a peach garlanded with flowers and some neo-gothic ruins. Where it departs from previous work is in the presentation of each of these subjects on stoneware chargers, thrown by the artist over a summer residency at the Bernard Leach studio in Cornwall. This connection to the godfather of British studio ceramics, and through him to centuries old traditions of Japanese ceramics, puts Angell’s work in a different light. The Troy Town Pottery that he founded calls itself a “Ceramics Studio for Artists” and states its mission as: consolidating ceramics within the plastic arts, rather than treating it as a special medium or one that only has certain functions or readings. These ambitions, however, are not at odds with a complete seriousness of purpose when it comes to some techniques. The works in the current show are listed with the details of their glazes, for example: ‘temmoku and shino’ or ‘shino and copper’. These combine the standard range of Leach Pottery stoneware glazes with new Shino glazes that are based on others from the Japanese Momoyama period (1568-1600). A fan of the late British ceramic artist Gillian Lowndes, who was renowned for incorporating everyday objects such as teaspoons within her works, Angell’s Platter, 2017 mounted on the rear wall of the space seems like an homage, of sorts. 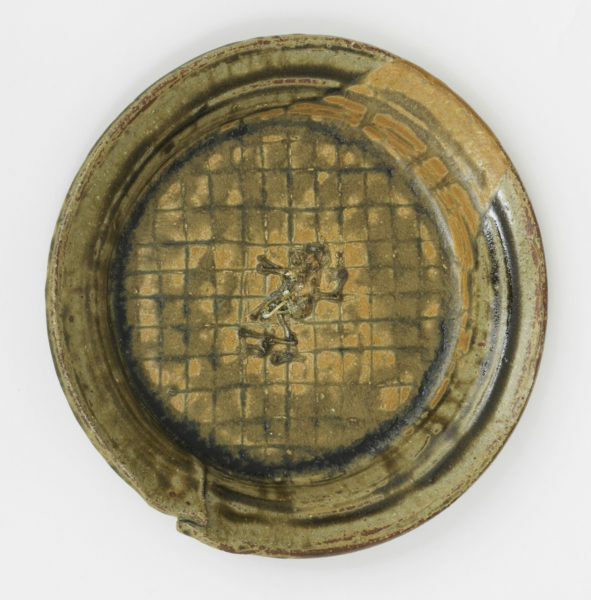 In the centre of the reduced stoneware platter is the diminutive but complete skeleton of a frog. How it survived the firing process is a mystery – but there he lies, his final resting place part of the mineral ash glaze. There is much arch chatter about the fashionableness of ceramics at the moment, but Angell’s level of enquiry into the medium suggests it is more than a passing fancy.